The Gem Collection would like to congratulate Haven Cook for being chosen as a Runner-Up for the Rembrandt Charms "Story of Your Life" Contest. 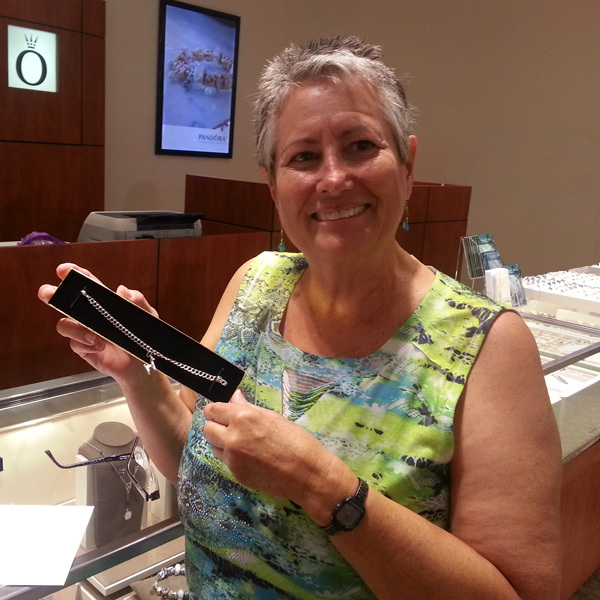 She won a 7" Sterling Silver bracelet with Poodle charm as her prize for submitting the following story. "The best thing I can compare my life story to is Noah's Ark (Charm #1863). I grew up in Kentucky, and when I think about Kentucky I think about horses (Charm #0356). Right after high school I enlisted in the Air Force and flew away like an eagle (Charm #7817). Afterwards, I went to college on the GI Bill at my hometown university, where the UK Wildcats (Charm #4150) play. The first in my family to ever go to college, I was elated to get accepted into Yale for graduate school, turning in my Kentucky blue for Yale blue and becoming a Bulldog (Charm #2061). The day I graduated, I turned in my cap & gown and flew off to join the Peace Corps for 2 years in Africa, where my favorite memory is riding a camel (Charm #1163)! I've worked for 20 years as a forester in Florida, sometimes stepping over the alligators (Charm #7757) but generally confined to a computer writing environmental impact statements. But every summer I shake off the computer doldrums and like a Phoenix (Charm #6542) rising from the ashes, I head out west as a wildland firefighter. But it gets harder and harder to leave behind my better half, a 5-pound toy poodle (Charm #3042) named YaYa, who is in her 10th year as a therapy dog! My life centers around going on therapy visits to our local hospital with her, and leading our local volunteer Disaster Animal Response Team in operating pet-friendly shelters for the pets of evacuees and working on large-scale seizures from puppy mills, hoarding, and cruelty cases. My life has truly been as full as Noah's Ark!" The Rembrandt Charms “Story of Your Life” monthly contest invites consumers to tell their life stories through charms. Each month, Rembrandt Charms selects one lucky winner and several runner-ups. The winner receives a free sterling silver bracelet and all ten charms from their story. Runner-ups receive a free sterling silver bracelet and one charm selected from their story. Winners select their favorite local jewelry store to claim their prize. Join the fun and visit www.RembrandtCharms.com to enter and to read previous winning stories.